BAE Systems‘ U.S. arm has received a potential $1.7 billion contract from the U.S. Army to manufacture additional howitzerz and ammunition carrier vehicles. The contract has a $413.7 million initial value that will cover execute the third and final option under the ongoing low-rate initial production of M109A7 self-propelled howitzers and M992A3 carriers for artillery pieces, BAE said Friday. The company will initially provide 48 vehicle sets to the Army and could produce an additional 60 sets annually over a three-year period thereafter if the service branch exercises options for the full-rate production phase. 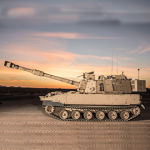 “We have been working with the Army to design, develop, build, and test this vehicle for several years,” said Adam Zarfoss, vice president and general manager of BAE Systems Inc.‘s combat vehicles business. “By working closely with our customer, we were able to design a vehicle that meets the needs of the current forces, and provides the system infrastructure and electrical power generation that leaves ample room to incorporate future capabilities,” Zarfoss added. M109A7 employs the main armament and cab structure of its M109A6 predecessor and features a chassis structure designed to increase survivability as well as support integration of drive-train and suspension components found in Bradley infantry fighting vehicles. The company also incorporates a 600-volt on-board power generation, distribution and management system with high-voltage electric gun drive and projectile ramming systems into the latest howitzer model. BAE noted that M109A7’s digital backbone and power generator systems are designed to integrate with current battlefield networks of the Army’s armored brigade combat team.